Dining At The Ravens Cookbook Review Vegans Eat What? Jeff and Joan Stanford moved to Mendocino County in the late 1970s, never dreaming that one day they would own and operate The Stanford Inn by the Sea and The Ravens restaurant. They built the Stanford Inn by the Sea, the Ravens restaurant, and their family while on this land. A few photos are shared in the cookbook that show the progression of their lives while “living on the land”. The Stanford family has created a welcoming atmosphere that invites us into their lives. About the book & restaurant…. This book is more than a cookbook. 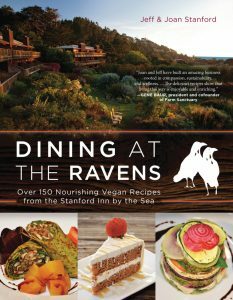 In addition to the recipes from the restaurant itself, it is the story of how the Ravens restaurant and the Stanford Inn by the Sea came to exist. The restaurant does not have a “head chef” as almost all restaurants do, Rather, it is uniquely operated by using more of a “collective” philosophy. Each person in the kitchen is welcome to develop recipes and the results are discussed and improved by the entire group. The property includes the Inn, the restaurant, gardens where much of the food is grown, and lovely walking and hiking areas. Dogs are welcome at the Inn. The countryside looks spectacular and the ocean provides an attractive backdrop to the property as well. We are ready to visit now! Most of the recipes are accompanied by beautiful photographs. Many of the recipes are favorites at the restaurant. The recipes are clear and easy to follow. They include interesting flavor combinations. This restaurant competes favorably with other restaurants in the Mendocino County area so the quality of the cuisine is very high. Sometimes, this might mean that the fat content in some recipes used is more than a person might choose to eat at home if following a very low fat diet. Yet, that content is not at all excessive when compared to the recipes offered in many comparable cookbooks and restaurants. The authors state that they use less oil in their personal eating at home than the amount used in their recipes as served at the Inn. They go on to explain that they prepare the recipes they serve in this manner in order to more effectively compete with local eateries that specialize in serving high calorie dishes. If you are using no processed oils in your own diet, remember that it is very easy to modify the recipes presented in the Stanford’s book. We’ve chosen a silky red pepper soup (below) to share with you. Be sure to make the Balsamic Reduction as well as it really makes the soup pop! Add the olive oil to a stockpot and bring to low heat. Add the onion and shallot and sauté until translucent. Add the yam and potato and cook until tender, about 10 minutes. Be careful not to overcook the other ingredients. Add salt, cumin, black pepper, red pepper flakes and garlic. Cook for 3-5 minutes. Add bell peppers and stock to pot and simmer for 30 minutes, until potatoes and peppers are completely tender. Blend in small batches in blender until smooth. Combine the balsamic vinegar and agave in a small sauce pan and reduce over low heat until thickened and approximately half the original volume. To assemble ladle 1 cup of the soup into soup bowls. 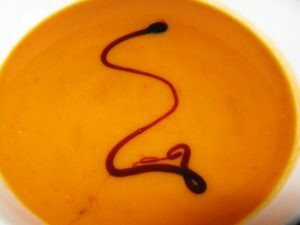 Drizzle Balsamic Reduction on soup in a circle and draw a knife blade through the floating garnish to create a pattern. Serve warm.